Knowing How to Price Art Prints and Giclees Is Essential for Visual Artists to Maximize Their Success in the Art Business. Pricing giclee techniques told. Knowing How to Price Art Prints and Giclees Is Essential to Success. 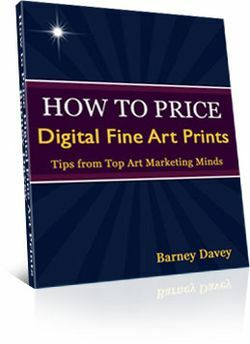 Last week, the How to Price Digital Fine Art Prints e-book was introduced to my readers. The announcement indicated it was being used exclusively as a promotion for buyers of my popular book, How to Profit from the Art Print Market, 2nd Edition. It also was mentioned the e-book would be available for purchase as an individual product at a later date. At the time, I thought it would be less confusing to stagger the book bundle and the e-book separately. In retrospect, it seems simultaneously offering the e-book individually, and as an incentive for new book buyers might have worked better. There is insight from this process for me. Perhaps some of you will gain something from it, as well. When You Are In a Hurry, Take Your Time! Just like many of my readers, I work full-time outside the art business. This is so I can provide affordable, reliable health care for my family. As such, everything I do for Art Print Issues, or new projects like the “How to Price Prints” e-book project, are done in overtime hours. I was proud of going from concept to the finished product in just over a month. But, I also was eager to get it to market. Given there were ten contributing authors, there were many details to attend to bring this e-book to life. The intensity of the producing the project left little time and energy to design the best way to introduce the e-book. Because I was too eager to publish the book, I did not reserve enough time to reflect and solicit opinions on the what to do about launching the book. Normally, it’s not that big of a deal. You have a product, and you put it out there. But, because this one had complexities such as being offered free in a bundle, and as an individual download, it required more time to finesse it than I put in. It’s not the end of the world. The book is available to purchase and download. Click Here to Order Your Copy Today! Questions were asked whether the “How to Price Art Prints” e-book was available as a free download to previous buyers. Considering readers have freely benefited from nearly 500 blog posts here; it seems normal this issue would arise. There is no affordable way to fairly distribute retroactive free downloads. I am confident the book alone provides far more value than the purchase price to artists. Given there have been thousands of hours spent publishing posts to help artists be more successful, it seems previous book buyers who need the “How to Price Prints” e-book should not mind making a small purchase to receive highly valuable information. It’s an easy affordable way to show support for the practical advice and art marketing content published in nearly 500 free Art Print Issues blog posts over the years.